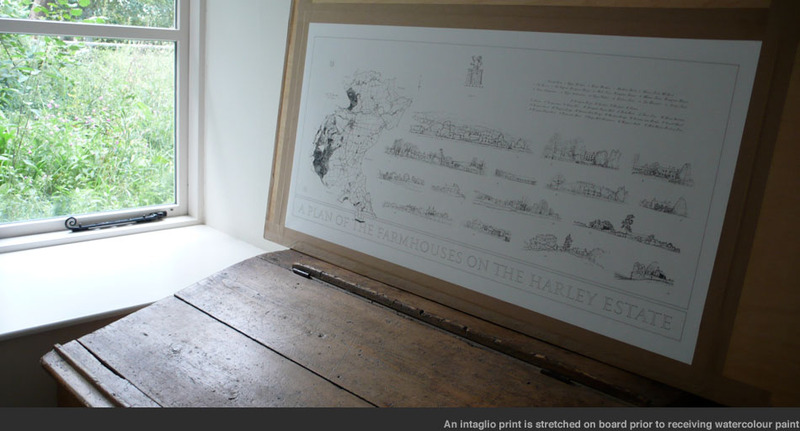 Drawings are carried out both on site and in the studio. These mainly comprise maps and plans, architectural and topographical views, scripts and scales. All elements are brought together to create a composition with rhythm, form and structure. Spatial areas are considered carefully to enable each element to rest peacefully within its context. A synoptic map in the form of a line image is created. An intaglio metal plate is made where the composed image is incised into its surface. The plate is then inked up before being passed through the press under pressure with dampened watercolour paper. 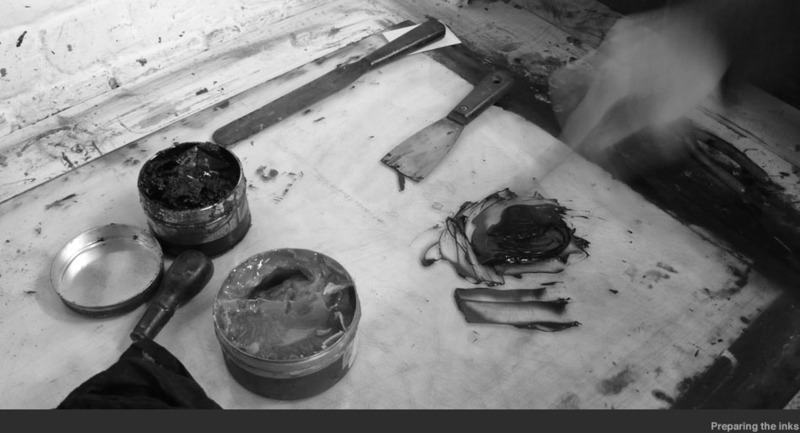 During this process, ink is transferred from the recesses of the plate onto the paper. An intaglio print is formed and left to dry. Images courtesy of Artichoke Print Workshop. The paper, made of 100% cotton and milled in northern Italy, is dampened once more for stretching onto a wooden board and left to dry. Watercolour paint is applied over a number of days in thin translucent layers to bring tone, colour and balance. The work is then cut from its board and placed in a card mount for presentation.